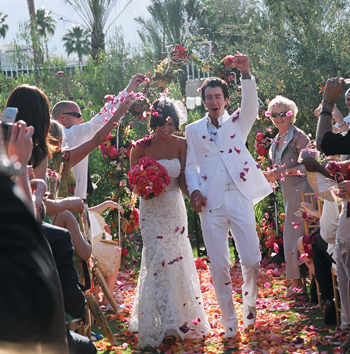 "The wedding was held at the beautiful Parker Palm Springs Hotel. The bride Susan has an impeccable eye for style. She designed the girl's milk-chocolate chiffon dresses. Tim the groom, dressed all in white and instead of a boutonniere, he wore a jeweled cross on his lapel that was a family heirloom. The guys wore a twill trouser with high-tops and white shirts (untucked) under Susan's strict styling instructions! There were pink peonies everywhere you looked, which is my favorite flower. This is, in my opinion, such a successful wedding on all levels. Susan enhanced the venue without trying to hard to duplicate the "Parker Theme" everywhere." Okay Guys......let's check out Susan and Tim's chic wedding...this is Part I - the bridal party..come back later to see the amazing reception decor.......Enjoy!! Our "style couple", Susan and Tim! I am loving the bouquet.....simply beautiful! 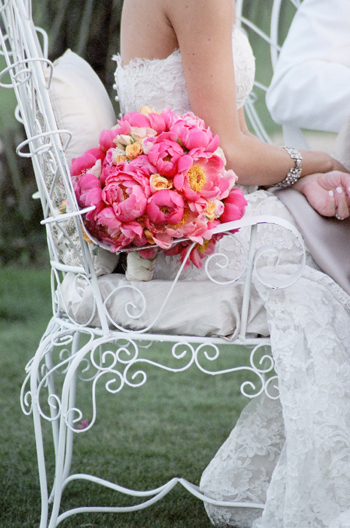 The floral designer is Michael Daniels of Silver Birches. I love the chocolate dresses Susan designed and the florals are perfect with them! I love this wedding...come back later guys.....trust me, you don't want to miss it! SO stunning! 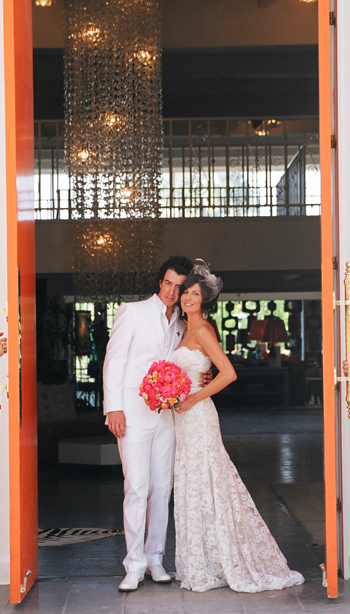 I love the picture of them standing in the doorway! HOW BEAUTIFUL!! I am loving the colors!! I can't wait to see Part II.. I love the colors, the flowers, the dresses and the photography wonderful, I can't wait for part 2. Looks like they stepped right out of a magazine. I really love the bridesmaid dresses and that the groom looks so GQ. Wow, what a STUNNING wedding!!! I love the bride's dress and veil. The whole wedding looks so chic and vintage! What inspiration and I can't wait for part two! Love the wedding gown, bridal bouquet and the bride's dresses, the groom is also very handsome all dressed in white! Looking forward to part 2. OMG! This is amazing, I am in PURE LOVE with this!! Thank you so much for posting! Please post more!!!! Susan and Tim are such a stunning couple with great personal style. Bravo for sharing such gorgeous photos with us. The bride's hair, her dress, his white suit, the brown bridesmaid's dresses with jackets, the pink and orange flowers.... yummy! what a great color flower to go with that setting! I LOVE the dress! Anyone know who the designer is? Anyone knows where I can get this headpiece?